On the heels of a trial last week involving a longstanding campaign of parental alienation, in which my client was seeking reunification therapy so that his child would be treated, and counseled, to learn to want to have a relationship with her targeted father again. I see more and more of these cases. Often, I am called in the middle of a pending case after a parent understands that their current lawyer, and the court, do not understand what is occurring. In other cases, I am called after a divorce has been completed, and the children that were awarded to one parent no longer wish to have a relationship with the other parent. I can also say that Parental Alienation is gender neutral. 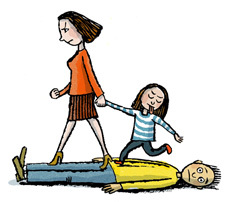 Both Dads and Moms can be targeted by the disordered parent for an alienation campaign. Children’s views of the targeted parent are almost exclusively negative, to the point that the parent is demonized and seen as evil. Every child has a fundamental right and need for an unthreatened and loving relationship with both parents. To be denied that right by one parent, without sufficient justification such as abuse, is itself a form of child abuse. Since it is the child who is being violated by a parent’s alienating behaviors, it is the child who is being alienated from the other parent. Children who have undergone forced separation from one parent — in the absence of abuse — including cases of parental alienation, are highly subject to PTSD, and reunification efforts in these cases should proceed carefully and with sensitivity. Research has shown that many alienated children can transform quickly from refusing or staunchly resisting the rejected parent to being able to show and receive love from that parent, followed by an equally swift shift back to the alienated position when back in the orbit of the alienating parent; alienated children seem to have a secret wish for someone to call their bluff, compelling them to reconnect with the parent they claim to hate. While children’s stated wishes regarding parental contact in contested custody should be considered, they should not be determinative, especially in suspected cases of alienation.